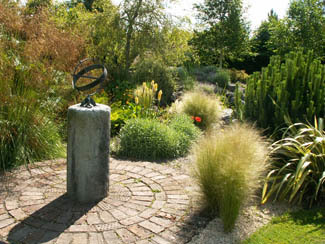 A 2 acre plantsman’s garden with a collection full of interest: allow time! 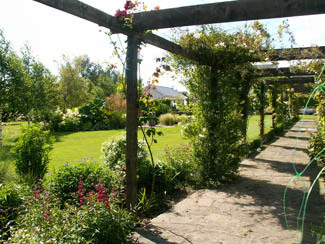 Many people will remember Neil and Sonia Williams’ excellent nursery at Carewswood, Midleton. 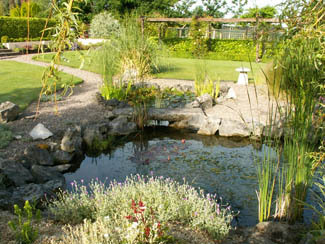 The Williams have retired, but over 12,000 plants came with them when they moved to their new home in 1996. With a wealth of treasures to accommodate, the Williams planted shrubs and trees for shelter in the virgin site, then created a series of informal beds and island beds in their front garden. This is a place to exclaim over VIP plants from collections of grasses to gorgeous day lilies. It would be worth a visit for some of the names of the plants alone, Euphorbia‘Silver Swan’, Miscanthus‘Silver Feather’, Hosta ‘Sum and Substance’ (so big slugs can’t reach the leaves), Hemerocallis ‘Gentle Shepherd’, Achillea‘Paprika’, a breathtaking ensata iris called ‘Caprician Butterfly’. And then there is the insight afforded into new introductions and choice varieties like lilac and cream Thalictrum‘Elim’ or the curious Australian grass tree Xanthorrhea, a scarlet delphinium and a tiger flower which looks as though it has been painted in brilliant reds and yellows. A new bed will be of special interest to collectors of newly fashionable grasses with numbers of Panicum ‘Warrior’ and ‘Squaw’ or swaying pennise-tums ‘Carly Rose’ and villosum contrasting with canna leaves striped viridian, yellow and scarlet - yummy! 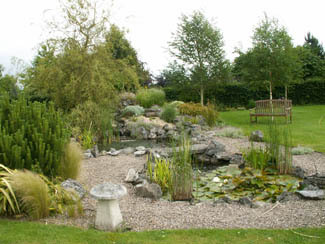 A pond and waterfall guarded by a weeping willow became the central feature of the back garden with a bridge made from the Williams’ former hearth stone. 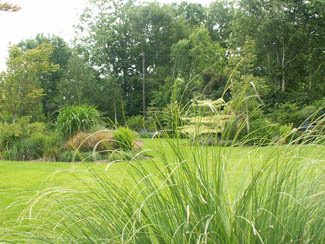 Beside it waving tresses of pony tail grass Stipa tenuissima and plumes of gigantea contrast with the luxuriance of a bog garden with primulas and ligularias. 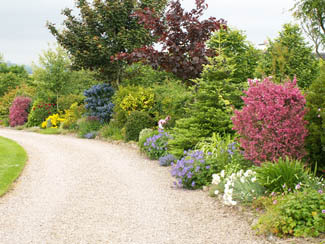 Around the perimeter a deep double herbaceous and shrub border with particularly choice varieties. Trees play a starring role here with Paulownia the foxglove tree, the swamp cypress, and Toona sinensis grown for foliage which is pink in spring and yellow in autumn. There are over 80 varieties of hellebores in the garden, old fashioned varieties of plants from the collection of the late Nancy Minchum: including agapanthus, penstemons, watsonias, tradescantia and begonias. A mixed shrub border with pieris, rhododendrons and bulbs loops around the front garden; there’s a red border known as Africa and there is a newer small Zen garden of contemplation, with acers and bamboos planted in gravel. Now the nursery baton has been taken up by the next generation of the Williams family, and plants from the Perennial Plant Nursery beside Ballymaloe House can sometimes be bought at Cedar Lodge. On the N25 take exit to Midleton. After 200 yards turn right over fly-over bridge. Turn left at T-junction past mobile homes. Take next right and the garden is 6th house on the right.